I’ve been at it again. After the successful chair and lantern painting of a couple of weekends ago, I’ve forged ahead with four more chairs, two more lanterns and a couple of mirrors too! Today I headed out to a local charity shop in Southsea which sells furniture and lots of household things – The Ark on Albert Road. It’s utterly brilliant, and its profits go to The Stubbington Ark where we got our two lovely cats. A few weeks back I’d spotted a large dressing table mirror going cheap. A little scratched but that didn’t matter – I wanted it for the garden. It was quite heavy to carry because of its shape but I managed to get it back home in one piece and started by putting it in place to make sure it was going to look how I wanted it to. It illuminated a dark corner very well so I set to work and painted it with some exterior wood paint (I bought a few sample pots last summer) after a quick sand down. I’d already painted another, smaller (and rather badly scratched) mirror in the same lavender colour – that one is propped up on my garden table and featured briefly in my previous blog entry. It was a nice warm afternoon so it was soon dry enough to put back in place. I’ll need to paint the back and give it another coat on the front but it will survive until Sunday afternoon. I like it. 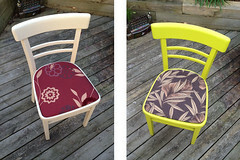 I’d already painted and covered another two chairs last weekend and, completely bitten by the bug, I grabbed my two mis-matched chairs to give them a new lease of life as well. The four matching chairs are in the colours of (from left to right) my daugher’s room, the kitchen, the living room and the bathroom. The red chair is the same colour as the dining room and will get a cover to match the covers in there, and the green matches another room. 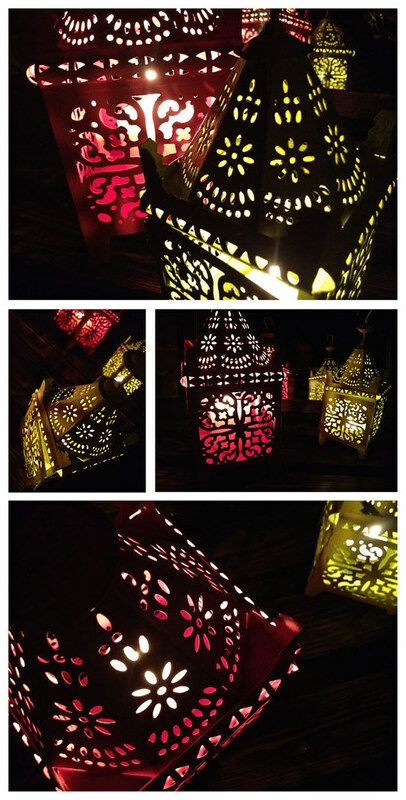 Finally, I’ve painted two more of the lanterns – also red and green. I gave them a little ‘extra’ with a quick spray of gold paint (I’ve bought nothing for this project except today’s mirror – all the paints I had in my ‘stash’ already). I should point out that I haven’t done all this in one day! I haven’t gone completely mad. I have had a lot of fun doing it, but I’m going to turn my attention to indoors for a little while now. I’ve been collecting garden ideas on Pinterest so I can add to it again later. I’ll be thinking about herbs next. All I need now is a party and some bums to put on the seats! I’ll be posting more home and garden projects in due course. I have a few pieces of furniture I’d like to renovate (so far I’ve only read a book about it! ), two rooms to decorate and a workspace to plan. Do let me know about your home projects – and if you’ve enjoyed this, why not sign up to hear about updates as soon as they’re posted. It’s been such a long time since I posted regularly, but now that the spring is here I’ll be making a start on some of the many ideas I’ve got buzzing round in my head. Before I can get properly underway I need to sort the spare room as it’s the only cat-free zone in the house – then I can get out my fabrics and make, make, make! I have been doing a few jobs though – a quick renovation of a chair to match my daughter’s room now that she has a desk to sit at, led to a second chair being kitted out to match our kitchen and dining room. The chairs will be for the garden eventually and I want them to reflect the rooms indoors – there are two more waiting to be done when I’ve located the right fabrics. Last summer I bought some cheap metal lanterns. They were all different shapes and sizes, but a rather dull cream colour. I bought them with the intention of sprucing them up and we made a start on that this weekend. I’ll be using up more of the left over paint from decorating the house, and also some of the gazillion match-pots we bought to try out different colours. Many of these are similar to the colours we eventually chose, so again these garden adornments will reflect what’s inside the house – and what a cheap project! Lots of us have some leftover paint, either from decorating or from craft projects. They can be put to great use in giving something a new lease of life. I’ve definitely got the bug again now, so I hope this weather keeps up so I can spend more time in the garden painting. I’ve also got some small pieces of furniture to renovate so, watch this space! 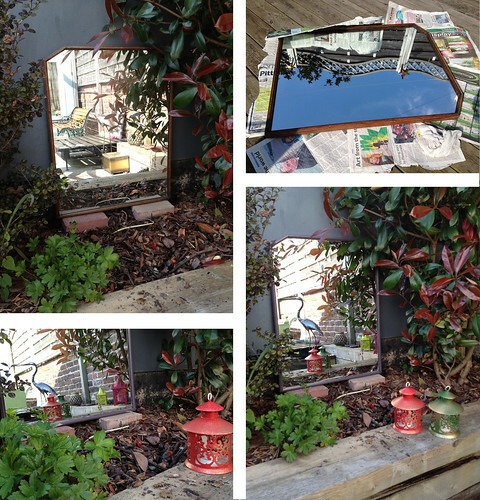 I’ve added a few mirrors to the garden too – they add a wonderful further dimension – and double the lights! I’d love to know what you’ve got planned for the spring. Why not sign up to hear about updates as soon as they’re posted?